I am doing an experiment this year: One day a month I will swap desks with someone in NYC. Why? I am fascinated by how other work environments are set up and feel. And what better way to get a glimpse of another office than spending a day? That’s exactly what I am doing today! 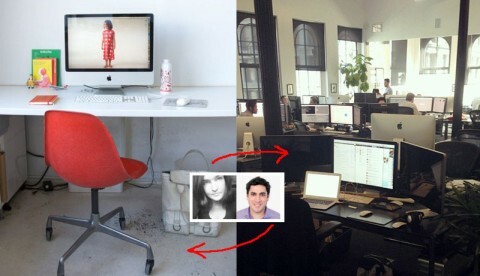 Jesse Hertzberg, COO of Squarespace was game and is currently spending the day at my desk in Studiomates. From what I can tell, he seems to have a good time! And lucky me, I am enjoying my day at the beautiful Squarespace office in Soho. Their space is all kinds of amazing, I have three (!) monitors at my disposal and an axe on my desk. I just enjoyed delicious catered lunch (envious), chatted with lovely folks and am now sitting on an ErgoErgo, getting work done. Experiment round #1 can be filed as “successful”! I can’t wait to find myself another desk for March! Any suggestions who I should swap with? Email me desk(at)swiss-miss.com or leave a comment below.